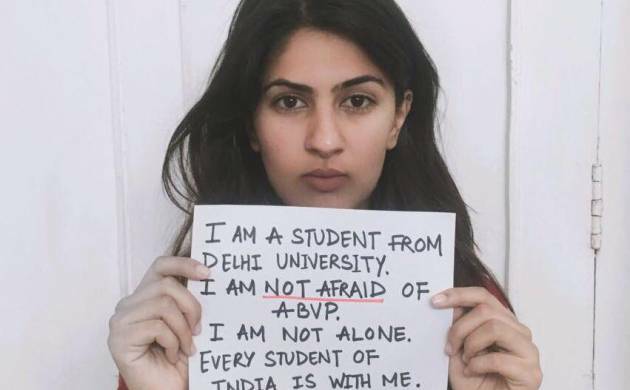 Days after DU’s Ramjas college saw violent clashes, a Lady Sri Ram College student who is a Kargil martyr’s daughter has initiated a social media campaign, “I am not scared of ABVP”, which has gone viral. Gurmehar Kaur, daughter of Kargil martyr Captain Mandeep Singh, changed her Facebook profile picture holding a placard which read “I am a student from Delhi University. I am not afraid of ABVP. I am not alone. Every student of India is with me. #StudentsAgainstABVP”. “The brutal attack on innocent students by ABVP is very disturbing and should be stopped. It was not an attack on protesters, but an attack on every notion of democracy that is held dear in every Indian’s heart. It is an attack on ideals, morals, freedom and rights of every person born to this nation,” she said in a Facebook status. “The stones that you pelt hit our bodies, but fail to bruise our ideas. This profile picture is my way of protesting against the tyranny of fear,” she added. The literature student’s classmates and peers started sharing the post, prompting students from various universities across the country to change their profile pictures with the same placard, as the initiative went viral. Kaur’s Facebook post so far has 2,100 reactions, 3,456 shares and 542 comments. Ramjas College had on Wednesday witnessed large-scale violence between members of AISA and ABVP workers. The genesis of the clash was an invite to JNU students Umar Khalid and Shehla Rashid to address a seminar on ‘Culture of Protests’ which was withdrawn by the college authorities following opposition by the RSS student wing.